BEIJING -- "When China wakes, she will shake the world." Napoleon's famous comment on China has had China-watchers scratching their heads for two centuries as to what exactly he meant. Was it a warning to Europe of a potential threat from the East? Or was he reflecting upon the fascination of his time with Chinese culture and its silks and ceramics? We may know the answer soon. China is awake and stirring. News of building projects and economic initiatives across the globe, including in its remote areas, are a testimony. So are some of the statistics. Take these at random: a Chinese billionaire is said to be created every week; China's space program is aiming for Mars; China has over 20 million students in higher education and some quarter of a million students in the United States. It can even boast the ultimate sign of wasteful conspicuous consumption -- Chinese students in the U.S., children of the elite, driving luxury cars. The scale of China's dramatic success has settled one great contemporary philosophic debate -- the superiority of Capitalism over Marxism, which the Chinese say in private is now as dead as a dodo -- while opening another. Which is better, an open democratic system, however noisy and unpredictable, or a highly centralized and controlled one? The U.S. and other democracies argue for the former; China is the living example of the latter. While the U.S. and China are at opposite ends of the political spectrum, there are few more important relationships in international affairs today than the one between these two. How they manage it will determine the future of the planet. The potential for conflict is high as China, the new kid on the block, appears to challenge the U.S. across the globe, but so are the prospects for peace as leaders of goodwill on both sides, appreciating the global nature of the relationship and the consequences of its breakdown into conflict, strive for understanding. That is why I felt privileged to be part of a small group of Americans who were in Beijing to participate in a track-two dialogue to promote understanding this July. While regular diplomacy is a formal process in which bureaucrats and senior statesmen meet to present "official" positions in the glare of the media, "track-two" diplomacy involves more informal, personal and off the record dialogues, which can sometimes be more effective. During the conference, I had a chance to observe the close interactions of the Americans and the Chinese. At the end, I even shared a comment which was appreciated by both sides in good humor. There is a Great Wall of suspicion and stereotypes separating the two peoples, I said. Since the last century the Chinese have seen Americans as arrogant, crude and disrespectful of other people's cultures. They imagine Americans like John Wayne in his cowboy films. The Americans, for their part, see the Chinese as humorless, cold and sinister. Almost from the start of Hollywood films, the Chinese were cast as villains from the Fu Manchu series to Dr. No. Who can forget the swarming hordes of young Chinese girls swinging deadly weapons with the aim of killing the white heroine in Tarantino's epic Kill Bill -- a not so subtle echo of the Yellow Peril. Yet, I noted, as the dialogue proceeded, these stereotypes melted. The Americans were impeccable in their behavior, courteous and ready to listen with respect. The Chinese were warm and gracious hosts; and they displayed a sense of humor. One of them said when the Chinese travel abroad, some of them tend to "behave badly." He explained that when being rebuked, people will ask, "where are you from?" and the Chinese will promptly reply, "we are Japanese." When I mentioned this to a group of senior academics at Peking University who had invited me for a lecture, one of them chuckled and admitted, "that was exactly what I said when I went abroad." The two nations have a complex relationship. Both are wary of each other. They rattle the saber with noise and bluster one moment and talk of global peace the other. The U.S. complains of China's aggressive presence in the South China Sea and its human rights record -- especially in dealing with its minorities living at its periphery like Xinjiang, Tibet and Inner Mongolia. China, in turn, complains of American "double standards," pointing to its human rights record in dealing with its prisoners or encouraging China's neighbors like Japan to challenge it while talking of peace. The Chinese will say that while European powers and Asian ones like Japan have invaded China, China has not crossed its borders to conquer other nations. On the surface no two peoples are so different. American society is creative, noisy and open; Chinese society is centralized and structured. Take a look at how Americans walk and look compared with the Chinese. Every American emphasizes his or her individuality in style. There is usually a swagger and lilt in the walk. It is as if the individual is saying, "I'm at the center of my universe. I matter." In contrast, the Chinese walk with a slower pace, dress to blend and carry themselves as if to say, "I am just one person, but I represent over one billion people who are like me." The locations of the iconic symbols of the two nations reflect the different nature of their societies. While in the U.S. the defining symbols are spread across the land -- the White House in Washington D.C., the Statue of Liberty in New York and Mount Rushmore in South Dakota -- the unchallenged center in China is located in Tiananmen Square in Beijing. The traditional Chinese viewed the imperial kingdom as the center of the universe. At the center of the center is Tiananmen Square, with the greatest symbols of identity laid out in perfect symmetry on its four sides -- the Forbidden City on one side, Chairman Mao's grand Mausoleum opposite it and the Party Congress and the National Museum taking up the other sides. 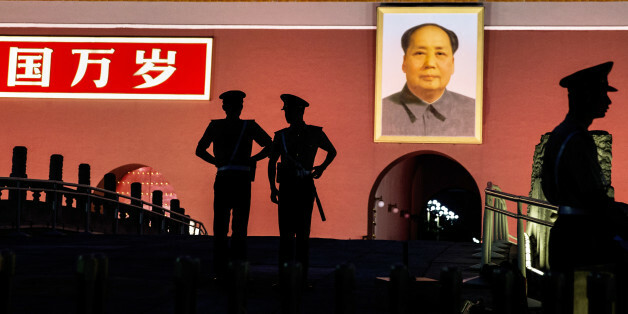 Gigantic Mao picture hanging on wall of The Forbidden City in Tiananmen Square. Kevin Frayer/Getty Images. In Tiananmen Square, culture and power, party and politics, the past and the present, fuse in monolithic solidarity. The message is loud and forcefully clear. As if to underline the centrality of China's vision, Mao's gigantic portrait hangs on the entrance to the Forbidden City. There is a banner proclaiming long life to Mao outside the Presidential Palace, the apex of power, which is also located there. Chinese visitors, who come in the thousands daily, many from outside Beijing, are here to celebrate their identity and nourish it. On any given day some three to four thousand of the faithful and the curious line up to pay homage to Mao. Tiananmen Square to the modern Chinese is what the Vatican is to Catholics, Amritsar to the Sikhs and Mecca to the Muslims. At the entrance to Peking University, the oldest and most prestigious in China, hangs a frame with words handwritten by Mao. He worked at the university and this would suggest an affiliation with the institution. In fact Mao was a lowly employee in the library and his experience of "liberal" professors was an unhappy one. He found them mean and petty. He would later excoriate intellectuals, mercilessly bashing them for the Cultural Revolution. In contrast President Xi Jinping studied at and obtained a Ph.D from Tsinghua University in Beijing, the other great educational institution of China. Tsinghua, created with American assistance, reflects the classic American campus with red brick buildings, sports facilities and green lawns and hedges. It offers world class programs with an emphasis on science and technology. Faculty and students here are constantly interacting with the outside world. Mr. Tingyi Wang, a brilliant political science student, is a typical example. He is currently based at a university in the Persian Gulf region and heading for a think tank in Saudi Arabia after his visit later this summer to Harvard University. Xi's own daughter studied at Harvard, under a pseudonym of course. Akbar Ahmed at the entrance to Peking University with deans and heads of department. It is with this background of dramatic change that we need to look at one of the boldest Chinese initiatives that could potentially alter the economic and political fortunes of entire nations and regions of the world. It is the Shanghai Cooperation Organization. Launched some two decades ago -- and bolstered by the additions of India and Pakistan this summer -- the SCO now has a membership of roughly half the world's population. In the last few years it has become President Xi's favored vehicle for conducting foreign policy and implementing his vision for global trade. That vision, called the "One Belt, One Road" policy, envisages a breathtakingly ambitious program to create trade routes linking these societies with each other and with Europe. Plans are still vague, but I heard talk of a land route that will evoke the Silk Road through Central Asia, to the Middle East and on to Africa and then Europe. There is also a maritime route along the coast of China and Southeast Asia, down to India and into the Middle East and on to Europe. Pakistan is a vital link in this scheme of things. The Chinese talk of Pakistan as an "all-weather friend," reflecting exactly how Pakistanis see them as well. The Chinese in private will go through the list of other close allies and point to their flaws: the North Koreans are seen as erratic, the "crazy younger brother," a scholar at a dinner remarked; Burma or Myanmar has let them down and they can never fully rely on Iran, according to another scholar, as it appears "too keen to be seduced by the U.S." That leaves Pakistan -- and Pakistan alone, in spite of its alliances with Western nations, has stood by China through thick and thin. China has reciprocated with a mixture of emotion and real politik -- it has just signed its biggest defense deal ever according to analysts, which gives Pakistan eight first-class submarines. It is a strange and unlikely love affair. Pakistan -- and Pakistan alone, in spite of its alliances with Western nations, has stood by China through thick and thin. There are, however, contradictions and tensions in the relationship. Pakistanis are an overwhelmingly Muslim nation, and Islam, because of the tense political situation in Xinjiang, is not a popular religion in secular China today. There is also a public debate about the extent to which Pakistan should be supported. Those opposed to it point out the nature of Pakistan's corrupt politics and breakdown of law and order. The broad Chinese view of Pakistan is that of a favorite younger brother constantly landing in trouble. The Chinese will express their protective affection for Pakistan and in the next breath talk of the need to ensure its stability and encourage its prosperity. It is this relationship that explains one of President Xi's central pieces in the "One Belt, One Road" policy -- the China-Pakistan Economic Corridor. Xi's commitment may be gauged by the fact that he has announced some 45 billion dollars for the project. It is breathtaking in its scope and vision and could alter the fate of the beleaguered Pakistani nation. It is a plan to connect China by road and high-speed train to the port of Gwadar on the Pakistani coast and transform the sleepy little town into a major international commercial and trading hub like Dubai across the Gulf. There would be economic spin-offs as trade and commerce would grow along the corridor. Akbar Ahmed at a lunch in a Muslim restaurant in Beijing with his book translated into Chinese. As a Pakistani American I am accustomed to the familiar Western media stereotype of Pakistan as "a nation of terrorists." Yet I was surprised to discover this was not the case in China. On the contrary, when people learned of my Pakistani background, I was treated with respect, kindness and affection. They would say, "You are family." Sometimes strangers would take selfies with me, as if I was a movie star, after they discovered my Pakistani connection. Pakistanis feeling down because of the nonsense in Western media should visit China to cheer themselves up. In Beijing I was also privileged to be hosted by the head of the New Classic Press, which had just published the Chinese translation of my book "Journey into America: The Challenge of Islam" (2010). He said it was the first book to be translated from English by their press as the tradition is to translate books from Chinese into English. He said there had been intense debate about publishing the book as it was about Muslims, a controversial subject. Uighur separatist supporters and Turkish supporters of the cause hold aloft the flags of Turkey (R) and East Turkestan (the term separatist Uighurs and Turks use to refer to the Uighurs homeland in China's Xinjiang region) (L) as they shout slogans during a demonstration outside the Chinese embassy in Ankara. ADEM ALTAN/AFP/Getty Images. Xi's highways will take the Chinese through ancient tribal societies in South and Central Asia and Xi needs to pay attention to the situation in Xinjiang and deal with it through wise and compassionate policies. Otherwise Central Asian tribes will sympathize with their fellow Muslims in China and unrest will grow. We saw the recent protest attacks on the Chinese -- or anyone who the Turks thought was Chinese, which included Koreans. Such clashes could further inflame the border areas and jeopardize these projects. There is also the ever-present danger of U.S.-China relations deteriorating to a point of conflict because of some minor incident that escalates. In this situation Pakistan has a potential role to play. Those of us who dream of a peaceful South Asia taking its place on the world stage as a cultural and economic powerhouse see a ray of hope in today's situation. We are still left with Napoleon's enigmatic comment. The answer to the inherent question contained in it may be tied to Xi Jinping's vision of the future of China. In either case, it is time to watch the awakening of China with interest. Akbar Ahmed, Ibn Khaldun Chair of Islamic Studies, American University Washington DC, is author of "The Thistle and the Drone: How America's War on Terror became a Global War on Tribal Islam," Brookings, 2013.